Original script drafts planned for Genele Erickson (spelled with "ck", but in the final version "Ericson") to be Frank's stepdaughter from his previous marriage with Renée; she was finally modeled into Renée's sister, i.e. Frank's sister-in-law, though. The writers planned for her to still have her own key to the Agretti Residence, which she kept over the years to unlock the Agretti Residence upon her arrival. They also intended her to be even more indelicate and hard-edged than in the final version, e.g. to even throw pieces of furniture out without asking Frank. Genele Ericson drives a red Chevrolet Corvette C4 Convertible. Writer BOB COCHRAN originally wanted her to drive a red yet otherwise unspecified model of a Mercedes-Benz in early script drafts. The filming location for the Agretti Residence driveway (close-up when Genele gets off her car), is the driveway right in front of the big stage door to stage 10 on Republic Avenue at CBS-MTM (nowadays CBS STUDIO CENTER). A faint scenery painting can be seen in the background when the door is opened. - What a poor artwork of the set designers! The living room / study is now partly refurnished and painted in light beige (the blue wallpaper was removed). It now has a bar where the French doors to the patio used to be. The window is now right next to the door; as it will become obvious especially in the following episode in comparison with last season, the element of the wall and the element of the window in the interior set have apparently been switched when the set was rebuilt after the hiatus. Compare the first three screen grabs for the set in the previous season. Across the entrance to the living room, where there used to be closed doors last season, there is now a very small room behind those doors; the room leads to French doors, which lead to a new patio that is, as will be seen in # 213, also accessible from the kitchen. Frank's bedroom and bathroom are featured for the first time - a new interior set. Omitted was an act 1 scene from early script drafts in Lance and Pilar's bedroom in the Falcon Crest Victorian Mansion, in which Lance stands and primps in front of a mirror in his new perfectly tailored suit right before his meeting with bank manager Beeker. Inconsistency: Falcon Crest is said to be close to bankruptcy - the Tuscany Bank threatens to have it managed by a trustee. Considering this is all about a loan of only $ 20 million, this is ridiculous. Giving respect to season 4 when the net worth of Falcon Crest was at least $ 90 million (Francesca's third: $ 30 million) and to the later acquisitions, especially the expansion (tripled in size at the end of season 4) as well as the takeover of several wineries including the Gioberti Winery (net worth: $ 30 million), Falcon Crest must have at least a net worth of over $ 120 million. Even the damages by the fire in season 8 and Michael Sharpe's bribing the bank manager into calling the current loan cannot have caused such a financial disaster. - The writers should have studied the old episodes! Sharpe watches a "Roadrunner" and "Wiley E. Coyote" cartoon on TV ("Looney Tunes" characters). 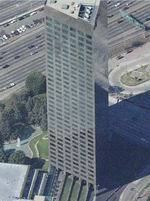 The offices of Murdy & Sampson are portrayed by leased office space in the Universal City Plaza Building in Universal City, CA (interiors only). Forrest Murdy's office is situated in the north-eastern corner of the building. - The exteriors of the Universal City Plaza Building were used as San Francisco Investment Company in # 121 and as The Thirteen's New York headquarters in # 182 and 183. In early script drafts, Murdy & Sampson was called Moody & Gray, with Bill(y) Moody (later renamed Forrest Murdy) being the major shareholder. Jason Sampson was originally not supposed to be one of the senior partners, but one of the associates. According to a CBS press info, actor NICOLAS COSTER was originally cast to play the character of Forrest Murdy. But DENNIS LIPSCOMB finally won the rôle. The filming location for the San Francisco café where Richard meets Lauren for the first time is the Cafe Sierra in the lobby of the Registry Hotel (nowadays Universal Hilton) in Universal City, CA. The shot of Frank in the foyer of the Agretti Residence guest wing in this season's main title (right screen capture) is from an unused version of the scene in # 209 (compare the left screen grab for the version used in that episode). Mistake: The close-ups of Frank and Genele in the Agretti Residence bathroom are from various takes that were combined in the editing process. This becomes apparent when Genele's left hand is out of the camera angle in the first frame, but close to Frank's head in the subsequent frame filmed from across. Furthermore, bathing foam can be seen in Frank's face in one frame, but is gone in the next one. Again, this is the typical mistake caused by the particular close-up filming technique - check # 011 (Lance and Lori) for details. Although the series is still filmed at CBS-MTM STUDIOS, a new Falcon Crest Victorian Mansion exterior set (first floor to be seen only) is used for this episode as well as # 210, 213 and 215. This is not identical with the usual veranda set usually built on sound stage 10 at CBS-MTM. But it is the set that used to be the Walton House from EARL HAMNER's previous series, THE WALTONS (compare # 064), built on the backlot of the BURBANK STUDIOS (nowadays WARNER BROS. STUDIOS), where the first three seasons of "Falcon Crest" were shot. The Walton House underwent major changes to adjust it to the needs for "Falcon Crest". 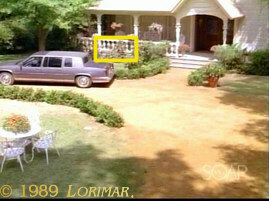 In 1991, the set was destroyed in an electrical fire; for later reunions of "The Waltons", the Walton House was rebuilt on the WARNER RANCH a few blocks north of WARNER BROS. STUDIOS in the 1990's. The veranda itself is built with pretty much attention to detail. But the set is smaller than the real Villa Miravalle, as it can be noticed easily when tall DAVID SELBY is standing in front of it in # 213. There are fewer pillars in the veranda banisters than in the real Villa (see yellow mark). Besides, the horizontal beam atop the pillars has little wholes for decorative purposes in the real Villa (see red mark). The two small stained glass windows in the main tower are missing (see mark). The driveway is a pebble / dirt path rather than the paved driveway in front of the real Villa; beginning with # 213, however, the driveway in front of the set will be paved, too. The circular shape of the driveway is the wrong way round - it should rather be circular around the house. The lawn area adjacent to the veranda, as featured on the show, is not there in real life. The three palm trees are missing. Explanation: The surroundings might have slightly changed when the Victorian Mansion was reconstructed after the fire. - This, however, is in contrast to the show still using old exterior footage of the real Villa in many scenes. The scenes in downtown Tuscany - Chao-Li shopping on Town Square (where the Founders Day Parade was held in # 030) - are filmed on Midwest Street on the backlot of the BURBANK STUDIOS although the show is regularly filmed at CBS-MTM STUDIOS. Julie and Sandy, the girls Charley meets downtown, mention the rock band Van Halen. The song Charley plays from the tape in the Falcon Crest Victorian Mansion is "That's Amore" by DEAN MARTIN. The painting in the Falcon Crest Victorian Mansion living room is an original MONET according to Charley. It is obviously one of the countless Impressionist style paintings (oil on canvas) CLAUDE MONET (1840 - 1926) produced as a part of his series of waterlily pond paintings. While, with almost all artwork in the Victorian Mansion, it remained unanswered throughout the series if they are originals or if they are meant to be reproductions, this picture is definitely an original if Charley is correct - i.e. the picture in the show's universe only, but not the prop, of course. Fictional entity: Sharpe buys Overdyne (originally called Red Mountain in early script drafts) stock. Michael Sharpe mentions Richard kidnapped his mother "last year". - First, it was earlier this year (1989). Secondly, why do the producers remember now, but did not in Richard's sentence in # 206? Product placement: A bottle of Perrier mineral water is on the table in the Agretti Residence patio. The scene with Lance and Pilar driving along a country road in his convertible is obviously taken in the studio. It is a cheap blue screen technique - the very same seen as in the scene with Emma and the Habermans in # 171, with Rosemont in # 181 and with Richard in the police car in # 206. These writers have no idea what a mess they make up: How can Richard be broke? As if he had no private money somewhere! - Next episode, he will suddenly be able to buy Forrest Murdy's share in Murdy & Sampson. Being broke this episode, where will that money come from? Deleted scene: The director's cut of this episode contained an act 3 scene, in which Chao-Li arrives in a cab in front of the Falcon Crest Victorian Mansion and unloads the groceries from the trunk; early script drafts even suggested that he arrive on foot, having carried the groceries all the way to the house from the Town Square. Charley, who had left the Town Square with the two girls in the limo before, feigns innocence since Emma is present while Chao-Li curses, rattling off some Chinese invective. - This scene was filmed, but removed in post-production. The first scene in act 4 featured Lance and Chao-Li trying to work out together in the gym at Falcon Crest in order to work off their respective frustrations. The most important line in that scene was in Chao-Li's dialog: "We must be patient, endure... never forget the spirit of Angela. She will bring us through this." Also omitted was a scene with Lance (still sweaty from his workout with Chao-Li) and Emma discussing Charley in the upstairs hallway of the Falcon Crest Victorian Mansion. Original plans included Charley trying to hand the earrings he ripped off from Sandy as a gift for Pilar to Lance, who refused to take them, realizing that Charley only tried to be coming on to Pilar. Maury's jewelry store is the same interior set as Richard's house - just redecorated (compare hallway and doors in background). VACHIK MANGASSARIAN, the actor who plays the maître d' in the restaurant where Richard and Sharpe have lunch this episode, portrayed the P.R. director of Liz and Richard's baseball club in season 7 (center of left screen grab). Fictional entity: Richard talks with Sharpe about a deal concerning Wellington Tender. It is estimated that Murdy & Sampson will make a profit of $ 40 million in the Overdyne deal, i.e. their net worth will triple. So their original net worth must have been $ 20 million. - In the end, their real profit will be $ 42 million. Strange: Richard mentions Sharpe has children (plural!) of his own. - In # 215, Danny will be introduced as Sharpe's alleged son and his only (!) child. SHAHRAD VOSSOUGHI, the actor who is introduced as Nick Massoud, Sharpe's chauffeur, this episode, also portrayed Rosemont's chauffeur and a waiter at The Max nightclub at the Del Oro in season 7 (compare # 179). The shot of Pilar in the Tuscany Bank in the current version of this season's main title (right screen capture) is from an unused version of the scene in this episode (compare the left screen grab for the version used this episode). Another mystery only the writers could answer: Why does George Beeker, CEO of Tuscany Bank, not know Richard Channing? Did he live on the moon the last seven years?! The executive offices of the Tuscany Bank are portrayed by a room at the Registry Hotel (nowadays Universal Hilton) in Universal City, CA. The parking lot (scene with Genele and Frank) is also situated on that property. The red Volvo sedan is used as a prop again; this time, on the Tuscany Bank car park (compare # 055 for details). Season time frame: Day 1 of the current episode (Richard's first day of work at Murdy & Sampson) is Tuesday, 10/17/1989, as it can be concluded from # 210 (see there). A few unseen days or weeks must have gone by both during # 208 - between the power outage in the hospital and Vogel's refusal to do business with Lance; also before the scene when Pilar goes to Vogel to sleep with him - and between # 208 and 209. According to Lance's statement at the beginning of the current episode, he only has three days to raise the money to pay back the loan to the Tuscany Bank, which means the episode closes on Friday, 10/20/1989 (days 2 of the episode). This also makes it clear that the days between night 1 (10/17/1989) and day 2 (10/20/1989) remain unseen in the current episode.